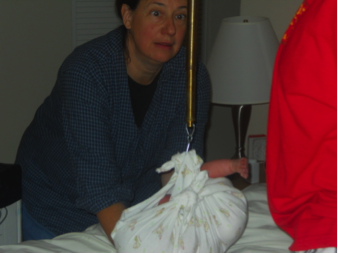 As an experienced homebirth midwife, I thought I was pretty well prepared for my own labor and birth at home. I’d spent 4 years in intensive nursing and midwifery training, participated in over 200 out of hospital births, and even prepared for my own birth by taking a Birthing from Within course with my wife, Trisha. But what I learned after 2 days of early labor and 30 hours of active labor is that all the experience in the world was not enough to prepare me for the most intense and most wonderful experience of my life! 10 days after my due date, I woke up to some bloody show and some mild, irregular contractions. All day, I eagerly anticipated my labor picking up. I did my best to distract myself with activities I had planned for early labor. But by that night, nothing had really changed and I figured I should try to get some sleep in the event things picked up during the night…. And I slept really well! The next day, I had an appointment with Erin and Mairi, and everything checked out perfectly. 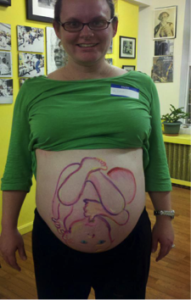 We decided that since I was having some signs of early labor, we could augment my labor with a stretch and sweep of the cervix. The exam was intense, but I was really happy to be doing something to help move things along. Throughout the day, my contractions got a little stronger but were still irregular. I was able to take a nap, which I’m grateful for in retrospect. By the time I woke up from my nap around 5pm, my contractions seemed to be a bit more intense and seemed to be following more of a pattern than before. Over the course of the next few hours, the movie we were trying to watch got way less interesting, and my contractions became the focus of all my attention. I thought they were painful, but manageable. By around midnight, we decided it was time to call the midwives to come over because the contractions were strong enough that I felt I needed their support. Erin got to the house just before Hannah, who was previously a student midwife with me at Mary’s Center, and was now working Erin and Mairi. Through the night, my contractions got stronger and stronger. I had wonderful support from Trisha, Erin and Hannah. By around 5am, I thought I was feeling a small urge to bear down. Erin called Mairi and told her to come at this point, and she told me to just listen to my body and when the time was right I would know. I never really actively started pushing, but the intensity of the contractions had changed dramatically, and the pain I was feeling had migrated towards my back instead of just down low in the front. I asked Erin to check my cervix because I wanted to know if I was close to being able to push. I had progressed from about 3cm to 5cm, but she also thought that the baby’s head was turned facing up (posterior) instead of facing my back (anterior), which is not an ideal position for birth. I was pretty discouraged by this news, but felt motivated by the fact that it was daylight, and I could use the day to get the job done and have this baby. Over the next few hours, we tried a couple of things to help that last little bit of cervix melt away and encourage the baby turn into the right position. First, we stacked a pile of pillows on the bed, and I stretched out over them on my back so that my spine was arched and my legs dangled off the edge of the bed. I was to stay that way for 3 contractions. I managed to do it, but I can’t really tell you how I got through it! The pain was excruciating. Next we tried a technique called sterile water papules, which helped with the back pain I was having. Finally, Erin and Mairi suggested I do the stairs again to see if I could help the baby turn. I think this was the point where I told Erin I didn’t like her very much! After walking the stairs, I went into the bathroom. While sitting in there with Trisha, I broke down. I felt that this baby wasn’t going to come out, and we should go to the hospital because I desperately needed pain relief. While I was telling her all this and she was so intently listening to me, I had a contraction and spontaneously started to bear down with it. When it was over, I reached between my legs and could feel the bag of water sitting right there! Trisha told me to be careful and not break my water. And of course, I broke my water… I really didn’t mean to! At this point in the night, it was a little before 11:00pm. I asked Trisha what day it was, and she told me Wednesday, November 28th. I then said, “So it looks like we will have a baby on the 29th!” How wrong was I! I moved from the bathroom to the bed where it was easier for Erin to check me. She waited for a contraction, checked my cervix and found just a small lip. She asked me to push and she was able to move the lip past the baby’s head. She also said she thought the baby had moved into the right position! In about 3 or 4 more contractions, the baby had moved all the way down and I could feel its head starting to crown. About 2 contractions later, Erin, Mairi, and Hannah (who was catching) asked me to put my hand on the head to help catch the baby myself. Meeting Eleanor for the first time and discovering that she was a girl was possibly one of the best moments of my life. I have never felt such joy seeing her perfect little face looking right up at me, within minutes of being born. So here are the stats: Eleanor Diane Shannon-Lay, born Wednesday, November 28, 2012 at 11:22pm. 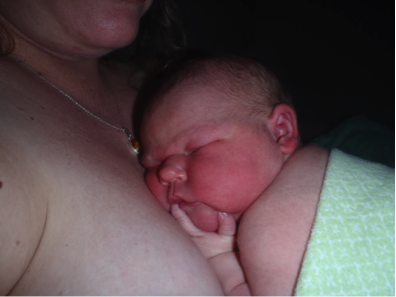 She weighed 9lb 13oz, and was 20 ½ inches long. Her head circumference was 14 ½ inches, and her chest circumference was 15 inches. She was a BIG Girl! We chose the name Eleanor for my grandmother, Eleanor Ruth McKinney. She passed away about 4 months after Eleanor was born, and was a huge part of my life. Thankfully, they did get the chance to meet before she died, and my grandma was very honored to have her 12th great grandchild carry on her name. We chose the middle name Diane for Trisha’s mother, Linda Diana Caudill. Trisha is Linda’s only child, and they have always been very close. We wanted to honor Linda by giving our child a part of her name as well. In closing, a few words to my dear, sweet Eleanor. Thank you so much for coming into this world. You are so loved and so wanted. Thank you for the lessons you have already taught me, and I look forward with excitement to the lessons I have yet to learn from you. I can’t wait to see you grow up, yet I know I am going to want time to slow down so I can treasure you at each stage of your life. I hope that as you grow up, you will know how much you are loved by not only your mommies, but by all of our family and friends who have supported us on our journey to bring you into this world. We love you Eleanor Diane! !